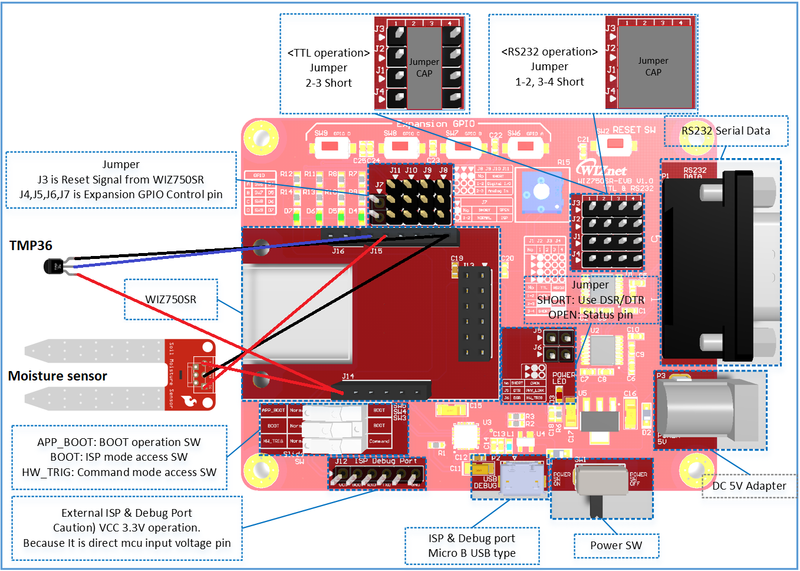 This project aims at implementing a powerful platform for connected home applications using an 8-Channel RS232 Relay and various sensors. This project aims at transforming a low cost RS232 Relay Board to a connected device that can be used in connected smart home applications. Thanks to a powerful software, you can add intelligence to the device by adding programmable triggers based on relays status' and external sensors (up to 4) connected to WIZ750SR-EVB GPIO ports. So, here is a step-by-step guide to make this device working. First of all, you have to configure the WIZ750SR board using WIZnet S2E configuration tool. To be able to connect to device from outside you home, you need to configure port forwarding feature within your home router. Port forwarding is a way of making a computer/device on your home or business network accessible to computers on the internet, even though they are behind a router. It is commonly used in gaming, security camera setup, voice over IP... After you have forwarded a port you are said to have an open port. The problem with port forwarding is that it relies on one premise: your internal IP address doesn’t change. If your router changes the IP that is assigned to a machine by DHCP, then you have to reconfigure Port Forwarding. But this can be avoided with an another feature within modern routers: static DHCP, also known as DHCP reservation. While configuring your router for DHCP, you have the ability to enter the MAC address of your computer/device network cards and enter which IP address to assign them. In the DHCP¨server configuration section in you home router web interface, Enter the MAC address of your WIZ750SR board and then assign it an IP address, in my case, I assigned the address 192.168.0.17. Then in port forwarding configuration section, assign the same local port for source and destination ports for the chosen IP address. For this project, I used the 8 channels version of RS232 Relay module but you can use also the 4 channels version or the 2 channels version. Power input: DC 12V (8.5-13.5V). Communication protocol: UART protocol communication, baud rate 9600kpbs, 8 data bits, one stop bit, no parity. Each data frame contains eight bytes. Two-way data transmission. 10A250VAC: means the max current intensity of connection, where voltage is equal or less than 250V (AC), is 10A. SRD-12VDC-SL-C: means the voltage of signal to control circuit is 12V. A relay has two main states: close and open. DC+: Electrode positive. In this project, we will connect wire with 12V to this connection. DC-: Electrode negative. Connect to GND. IN: Signal connection that is used to control relay. COM (Common Connection): Connect to power supply. We frequently connect it to positive wire of power supply. NC (Normally Close): Connect to COM connection when there is no trigger in relay. If we connect this connection to wire and don’t trigger relay with IN	connection, COM and NC will be connected. When we trigger relay with IN connection, COM and NC will be disconnected. NO (Normally Open): Only connect to COM connection when having trigger in relay. If we connect this connection to wire and don’t trigger relay with IN connection, COM and NO will be disconnected. When we trigger relay with IN connection, COM and NC will be connected. Once issue a command, will have a return frame, 7th byte of return frame indicates the status of relay. To connect external sensors to WIZ750SR module, I have soldered a right angle pins header to GPIO connectors. The software was developed using.Net Framework and C# language. It's a single window application with a toolbar and 3 different zones. Right button click : interlock the relay, means that when let's say relay 5 is interlocked, you can not operate other relays unless you right-click again on relay 5. Relays states are updated to be able to see in real time what are relays states. on the right, you have triggers zone and sensors zones. Trigger Zone is a very powerful feature to add custom trigger to your connected module. A trigger let you define a set of conditions (hardware & software defined) where when they are met, you can send specific commands to the relay module. We will see later how to configure triggers and some use cases. Trigger zones consists of four sections (one section per trigger). In each section, you have the condition in blue, the output command in green, the last time the trigger has been activated in black and an icon indicating if the trigger is active or not. When the trigger is inactive, all the output command are deactivated. The sensors zone below the triggers zone allows you to add external sensors to your connected module (up to four). A sensor can be either analog or digital. Each sensor is identified by an I/O port on the WIZ750SR EVB, a picture indicating if it is digital, analog or inactive and a user-friendly name. Sensors can be fully customized. Custom function mode: in this mode, you have to provide the name of a user defined C# public function. This function will be called every time we need to read value from the sensor. The read value will be passed as an argument to the function (in string format). To define the type of the port, you can use WIZnet S2E configuration tool and choose between Analog input and Digital input. Also, you can determine min and max Value for an analog sensor by reading displayed value for different configurations (e.g. for a moisture sensor, you read the value in a dry environment (min Value) and in a complete wet environment (glass of water) for max value. The source code compiles with Visual Studio .Net. VS2015 should also work. No extra libraries are required. The main file in source code is Mainform.cs .